Where's the Best Day Trip in Sydney? Spectacular Sydney is a fabulous place for day trips. This is one town well-endowed with fun things to do, along with stunning coastline and varied national parks. It's been voted as one of the world's most liveable cities for good reason. But what exactly is the best day trip in Sydney? Where do you go when you find 'liveable' a little lacking? Here at Weekend Notes, we have a wealth of information collated by our array of day trip connoisseurs. These committed folk spend endless hours hunting down first-rate days out. It's a relentless job, but as they say, someone has to do it. For day-trippers with energy, there are suggestions of great walks here and here. beaches here, and national parks here. Gardens can be a great spot for a day trip too. See some suggestions here and here. 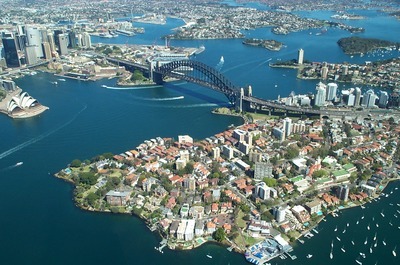 And if you're keen to soak up some of Sydney's history, there are ideas here and here. Other day trip aficionados here have spent long hours tracking down pleasant wineries. You can see their suggestions here and here. Yet others have the taxing task of sampling tasty fresh fruit at pick-your-own-fruit establishments. You can see the results of their extensive labours here and here. And still the list goes on. There are reviews of caves, spas, children's farms, and oodles of historic houses. So now it's over to you. When you're eager to escape the city, where, in your esteemed opinion, is the best place for a day trip? Train trip to Cronulla/Bundeena - explore the beach at Cronulla, then, just below the station you will find the ferry to Bundeena. This is one of the most beautiful ferry rides you will find. At Bundeena, walk along the harbour beach, explore the N. Park etc before you come home. There is also an art trail some weekends. A wonderful day out, spolit only by the longish train trip. Little Manly Cove: kids had a swim, then went for a walk and play at Little Manly Reserve. The Reserve is where the Manly Gasworks used to be, and there's some interesting historical signs around the park with some period photos too. Even though it was school hols, it was not crowded. Downside: Street parking is difficult due to the 2 hour limit. There is parking at the Reserve, not sure if this is limited. Walk from five dock to abbotsford through three great parks, including the first quarantine station in sydney - all along the water - turn off on way back for coffee at one of the local shops along great north road. Take your dog. Ferry from Pyrmont Bay to Milsons Point then a walk to the Squadron Club at Kirribilli for a great lunch. Sounds great! I must try it out. Sydney Rowing Club, Abbottsford, Sydney. Travel by ferry to Abbotsford from Circular Quay then a short walk from the wharf to the club where you can enjoy a meal at the bistro while enjoying the million dollar view of the Parramatta River. Return to Sydney city via Sydney Bus, the terminus is close to the club and wharf. A round trip taking as little or as long as you like.